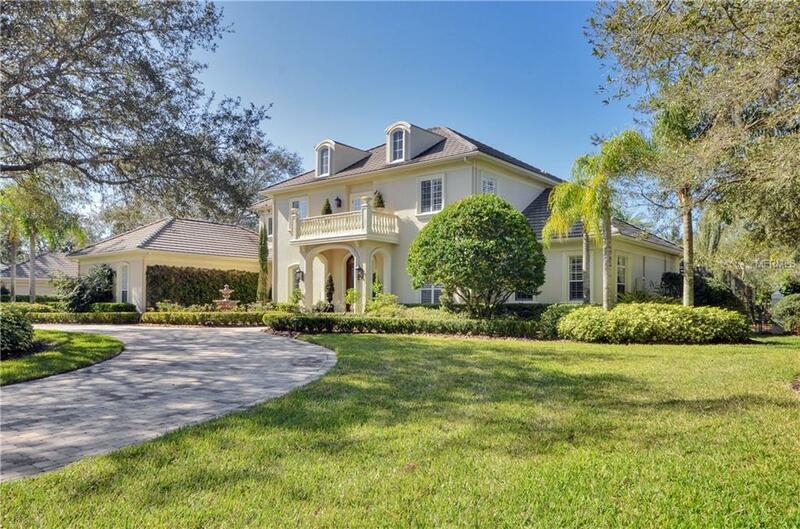 Exquisite 2 story Estate in Avila Tampa Bayâs Premier Gated Country Club Community. This luxury home full of exceptional details is situated on a beautiful large corner lot with lush gardens. The double glass door entry leads to an impressive two-story foyer opening to the formal Living Room & Dining Rooms. The open floor plan leads to a wonderful Chefâs Delight Gourmet kitchen having SS appliances rich wood cabinetry granite counter tops island huge walk in pantry breakfast room and impressive Family Room with beamed ceilings. The lush tropical pool and lanai area perfect for entertaining or resort relaxation includes a heated pool & spa Travertine decking outdoor kitchen & inviting wood/gas burning fireplace surrounded by a walled back yard lush landscaping & gardens offering total privacy. The downstairs Master Retreat has an inviting sitting area lavish Master bath with steam shower Jacuzzi duel sinks huge closet & lots of natural light. Upstairs are 3 bedrooms each en-suite a cyber area large loft/game room theater room additional laundry room & wonderful exercise room which is a flexible space overlooking the pool & lanai area. The many custom features include wood flooring crown moulding plantation shutters wine cooler surround sound bead-board lanai ceilings paver circular driveway 4 car garage & a charming service entrance. Exquisitely appointed inside and out. Close to I-275 Downtown Tampa TIA Steinbrenner school zone. Over 6000 S.F. of pure luxury!